Today is the National day of Sweden (Sveriges nationaldag), the tradition of celebrating 6th June as Flag Day began in the 1890s, when Artur Hazelius held such celebrations at his Stockholm-based open-air museum named “Skansen.” In 1916, the tradition gained yet more steam when it was honoured at the Stockholm Olympics. Every year, the King and Queen of Sweden take part in a ceremony at Skansen, where the yellow and blue Swedish flag is run up the mast, and children in traditional peasant costume present the royal couple with bouquets of summer flowers. Midsummer is an occasion of large gatherings − and to be honest, many Swedes take advantage of it to fulfil their social obligations, in many cases, whole families gather to celebrate this traditional high-point of the summer. 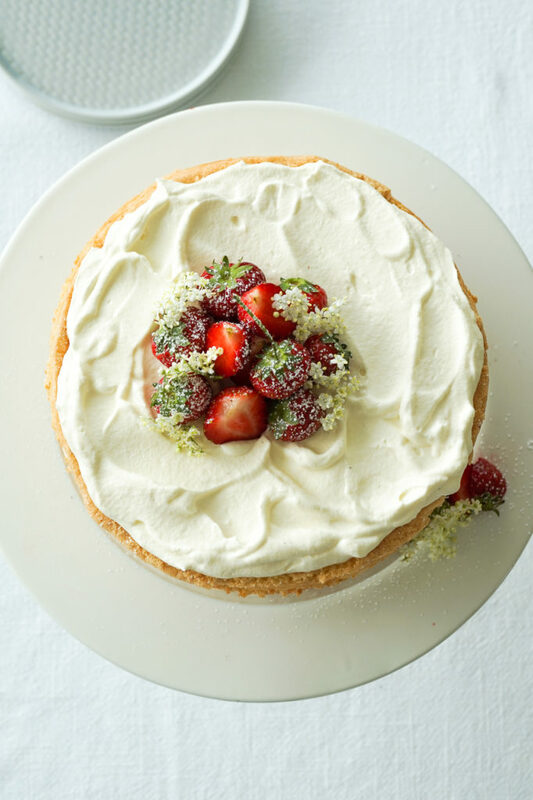 The essentials of a midsummer dessert are easy: strawberries and whipped cream. Sometimes that’s in cake form, called a jordgubbstårta, sometimes they’re just on their own, but the key is getting freshly picked, bright red berries. 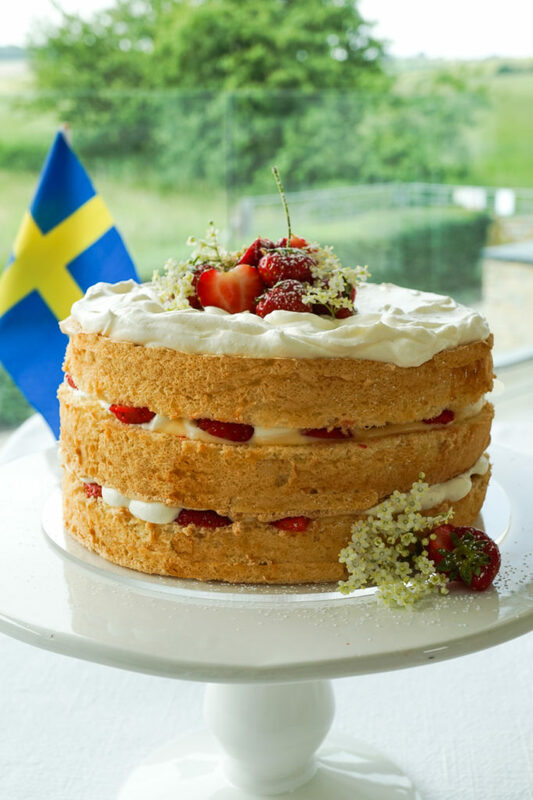 This is my version of National day or Midsummer Cake jordgubbstårta, a light as a feather vanilla sponge made with just eggs and flour, a combination of wheat and potato flour makes for a super light cake. 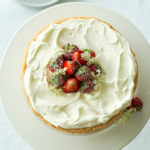 I have sandwiched the cake with an elderflower creme patisserie and freshly whipped cream and sliced strawberries. The cake takes no time at all to make and bake. The key is to whip as much air a possible into the eggs and sugar and then gently fold in the flours without knocking out the air. Try and buy the best quality strawberries or pick your own at a local farm, it’s a great way to spend a day out doors! Preheat the oven to 175C and grease and line 3 x 20cm cake tins. Seive the flour, baking powder and potato flour together. Crack the eggs into a free standing mixer and add the sugar and vanilla. Beat for at least 5 minutes or until really thick and glossy. Once you have reached this stage very carefully fold the flours until all incorporated. Divide equally into the greased tins and place in the oven. Bake for 15-20 minutes or until golden and, if you insert a thin skewer in the cake, it should come out clean. Leave to cool. In the mean time make the elderflower creme patisserie. Beat the egg yolks with the sugar until pale and fluffy. Mix the cornflower with the elderflower cordial. Bring the cream and milk to the boil and blend with the cordial. Mix the warm liquid with the egg mixture. Pour the custard back into the saucepan and simmer until the custard has thickened. Leave to cool covered so that a skin doesn’t form. Refrigerate for at least 2 hours before using or can be made the day before. Once cooled give the custard a good stir to loosen before assembling the cake. Whip the cream until soft peaks form. 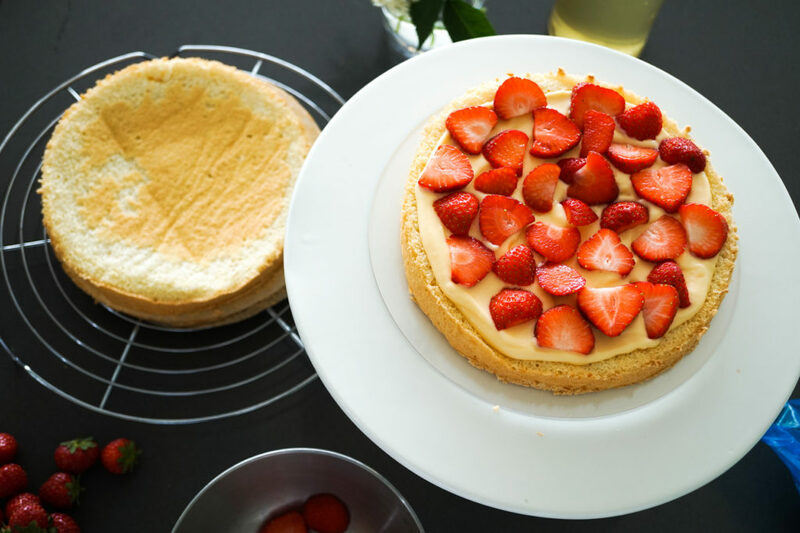 Assembling the cake; Place one of the three layers and spread some of the cooled custard on the top, followed by sliced strawberries and the some whipped cream. Proceed with the next layer as before. Finnish with whipped cream and arrange the remaining strawberries on the top. I decorated my cake with elderflowers. If you can't find potato flour, you can use cornflour instead.